Let me start by saying this, I've labeled these poses as beginner, but that doesn't have to mean they're easy. They will help you build strength, balance and flexibility. They are also poses you will return to over and over again in your practice, as they are some of the most foundational poses in yoga. They will continue to pose a different challenge on each new day you step on your mat. As these poses comes from a full 30 minute flow, you will want to practice the first three on one side, and then switch to the other. If you want to follow along in the full practice, the video can be found for free here: Yoga Foundation - Flow for Strength & Flexibility. Let's get in to it! 1. 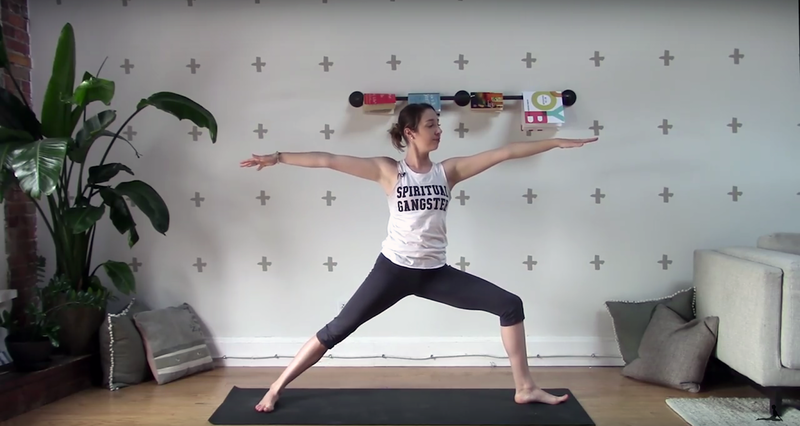 Balancing Table Top Pose - Make your way into a table top position. Take a second to ensure your hands are about shoulder distance apart, and directly below your shoulders. Check that your knees are about hip distance apart, and fall underneath the hips. Shift the weight more into your knuckles and fingertips to avoid pain in your wrists. Pull the belly in to firm up the core, as you extend the right leg back. Keep your hips from opening up, and your toes on the extended leg pointing down. Stay here with your abdominal muscles engaged, or take the pose a step further by reaching out your left arm. Your bicep should be by the ear, palm facing in and neck stays long. 2. Modified Side Plank - Keeping the right leg lifted, return the left hand to the ground. Reach your right arm up, opening to the right side. Your right hip should be stacked over the left, and your shoulders stacked similarly. Keep flexing through the lifted foot. 3. Low Lunge - Returning to hands and knees, work the right foot forward between your hands at the front of the mat. Feet should be about hip distance wide, while at opposite ends of the mat. Check in that your knee is over the ankle, and not ahead of it. As your arms reach up, draw your shoulder blades down the back. Tuck the tailbone down, lifting the chest, and pressing your hips forward and down. You are looking to feel a stretch in the left hip flexor in this pose. Flow through these poses on the opposite side, before moving to the second half of the poses. 4. Utkatasana (Chair Pose) - Standing at the front of the mat, feet about hip distance apart, bring your hands to your heart. Bend your knees, and drop the hips coming into chair pose. Bring more of the weight into your heels. Feel the engagement through your glutes and quads, as heat begins to build throughout the body. 5. High Lunge - From Utkatasana, take your weight into the left foot. Gazing at something steady ahead to support your balance, step the right foot back. Similar to low lunge, your feet should be about hip distance apart, but this time your knee stays lifted. Keep a generous bend in your left knee, as arms extend over head. Ensure that both shoulders and hips are facing forward. Bend a bit deeper into the left knee, without surpassing your ankle. 6. Warrior 2 - Open the body to the right side, turning the right foot parallel to short edge of the mat and bringing the heel down. The front knee is still bending. Your shoulders should be aligned over your hips, as you reach your hands/arms out wide and turn the palms to face down. Keep strong "warrior" legs as you hold the pose. You may also choose to take a Reverse Warrior (turning the palms up and reaching the left arm up to the sky, letting the right hand rest gently on the back leg) and then Extended Right Angle (left arm comes forward onto front thigh, as the right arm reaches up and over). Repeat poses four through six as you switch to the left side. Loving these poses and want to practice them with me? Check out the 30 minute class below. As always thank you for practicing with me. Please do subscribe to my YouTube channel, I'm adding some new types of content over there starting this month.